No. 11 in the series: ‘Someone else’s skin’ by Sarah Hilary meets a sealskin on the Touch Table in the Natural History Gallery. The Touch Table is a great way to see and feel things that are commonly found around the island. Compare the skin of a seal to that of an otter, both are mammals regularly seen around our shores. 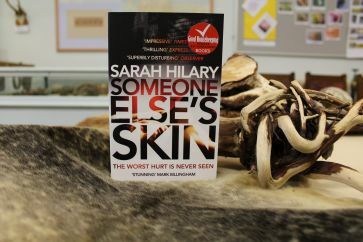 ‘Someone else’s skin’ is the first in a series of five critically acclaimed crime novels featuring Detective Inspector Marnie Rome. Sarah Hilary will be in the Museum at the opening session on Friday 3rd August and then again on Saturday 4th.